beautifully organizes your wedding details. With a fashionable flap that folds over the front, this design lets you store your enclosures like a little clutch purse. Unfolding vertically to a tall and dramatic finish, neatly tuck your enclosures in the bottom pocket of this design. Fashion, function, fun—Pocket Invites pack a lot inside their trendy little pocket folds! 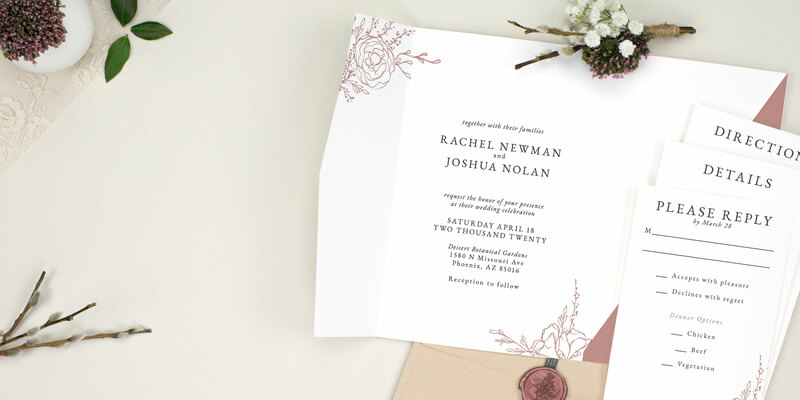 Complete your own ravishing Pocket Wedding Invite with our quick guide. As you pick the perfect wedding invite, remember there are so many pretty pieces that let you stylishly tie your wedding day look together! 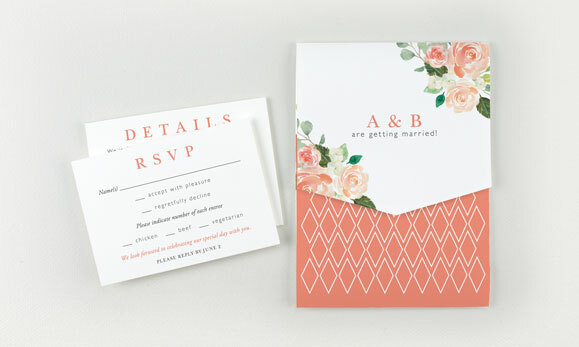 Our invitation designs carries coordinating pieces from the very beginning stages to the days following your wedding. From Rustic to Modern or Beach to Vintage, tie together the perfect day-of look that shows off your style and personality as a couple. Planning the perfect wedding stationery can be exciting, fun—and maybe even a bit stressful. But it doesn't have to be with the help of our Wedding Planning Tools. Find the best invitation wording that fits your situation. View lots of examples. From fun to formal, grab some ideas on how to make your RSVPs functional. Find out how many and what type of Enclosure Cards you may need for your big day. A quick how‑to guide on wording, formalities, and invite quantities needed. There’s a lot of etiquette involved with addressing your guests. We’ve made it easy! Stuffing your envelopes is fun! Here's a quick guide for creating the perfect presentation. 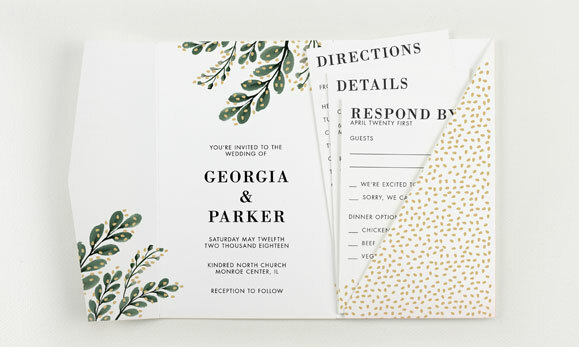 Practical and modern, Pocket Wedding Invitations keep all of your wedding details neat and organized. The stylish layers of step cards offer a seriously stunning presentation! Each Pocket Invitation design has coordinating Enclosure Cards available—adding harmony and depth to your entire ensemble. 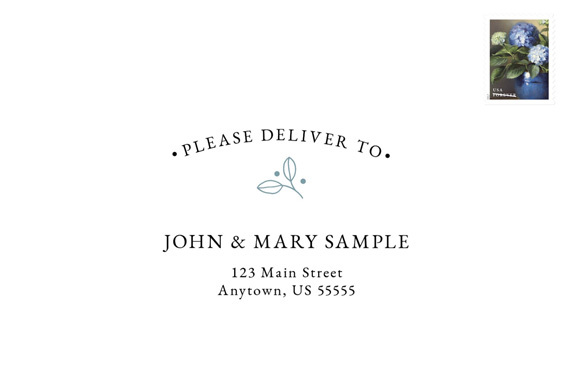 From RSVP Postcards to stair Step Cards, personalize each Enclosure Card with your own colors, fonts, and wedding details. Add travel arrangements, driving directions, or whatever you'd like! Polish off your pocket with coordinating Embellishments—personalized by you! To fasten the outside, wrap a Vellum Band around your pocket and secure it with a self-adhesive Seal. For excitement and suspense, veil the inside using a soft sheet of Vellum. Personalize with your colors, photos, monogram—plus more! Embellishments, RSVPs and Enclosure Cards are sold separately from Invitations.